Take a quick trip back to the glory days at Italian Disco, coming soon to Downtown Baltimore’s historic Bagby building. Featuring a food menu designed by Julian Marucci, recognized as one of America’s Best Chefs, Italian Disco will also offer 36 beers on draft. Eat, drink, be merry and vogue to a jukebox loaded with the best dance-floor cuts from the 70s and 80s, or marvel at our elevated DJ booth, sure to keep the crowd going until closing time (full bar until 2am). Whether looking for sensible lunch, dinner or takeout options, or gearing up for late-night revelry, Italian Disco is your new go-to restaurant and bar with a retro twist. Food was good. Service was good. One item that was a bit annoying was we were put at an outside table without being asked if we wanted to be outside. We had to ask to move tables once it started to rain slightly. Love the ambiance and music. Drinks were great, too! We should have left once we walked in and heard how loud the music was blaring... and that they raised the volume while we were there. The food and service were average, but we screamed to hear ourselves talk and left with sore throats. At the conclusion of our meal, the waitress asked if we wanted coffee and dessert. We did, but we couldn’t wait to get the check and leave. We went to a restaurant down the street for coffee and dessert. We will never go back. Highly recommend good cocktails and food. Had the fried calamari, meatballs and pizza was delicious. Cool spot, small though and a little loud. But great retro music! Great dinner! Will return! Pizza is outstanding and the service was fabulous! We look forward to our next visit. Food was great but you come out smelling like fried food!! Very loud as well but music and food were both great. Food was very salty (I got the blacken chicken penne and my boyfriend got the lasagna). The waitress was very attentive and polite. The portions were reasonable for the price. We waited an hour for our reservation to be sat but other than that it was great! We had the best night !! DJ Buddha Kenny Der was amazing, we danced forever. The food was delicious !! Our waitress ,whose name began with a "C" (and I only remember that from the monogram necklace she was wearing ) was ON IT !! Our glasses were never empty, she was great!! Great place and super accomadting for a large group. We had three extra people and they took are of us. Great music, delicious food and a fun place to hang out with friends. Everyone in my party loved their entrees! Great pizza for thin(ner) crust lovers. It's worth stopping by if you're in the area and want a more casual experience. Everything was really outstanding. Atlas group has done an amazing job n elevating Baltimore’s food scene. One item to consider is the music level. It’s too loud. Someone went up twice to lower the volume. We didn’t ask but others obviously did. I know modern restaurant design creates what is almost an unsafe decibel level, but why add to it? Especially early in the evening(we had 5:30 reservation). Thank you for another great dining option. Great place for the pizza. The Mozzarella sticks were wonderful. Can't beat the music. This was a first date that went very VERY well! All of the staff (especially our waitress, Mia) paid very close attention to us at all times. The food was average but the staff, cocktails, and ambiance made up for it! We just happened upon Italian Disco when visiting Baltimore for the weekend and looking for pizza. The classic meatballs were AMAZING!!! Pizza was fresh and delicious, as well. Definitely recommended for dinner, especially on a Saturday night as the ambiance was more fun with the disco ball and great music!! Everything was delicious and the service was good. Great ambiance, but wish it was a little bigger so it didn’t feel as crowded. High top tables in the center are the worse place to sit. Customers standing at the bar bump into your table and the waitresses have difficulty carrying food and drinks because of the narrow passageway. Entrees are served at different times and we were a party of two! Timing is important. Bring back the old Bagby’s which was a much better experience. Everything is homemade which is why we love it. The meatballs are very good too! Great spot. Repeat customers. We ordered several appetizers and got great help from the staff to avoid over-ordering. Wonderful experience! Great food, good menu...Great casual italian. Love this spot for lunch or dinner!! Music was a bit loud where we were seated - that would be my only complaint! Pizza crust was great but otherwise food left a lot to be desired, and pasta was cold!!! Great how it is now and I hope they do not change it. It doesn’t need to be another fancy restaurant in Harbor East. Let it be a casual restaurant bar that has a dj and some great pizza. Some of the menus are a little pricey for what it is but it has a cool feel. This is a fun place, you need to go with a group. I did not love the food - it was nothing special and it was pricey for what is was. I love the Atlas Group Restaurants so I had high expectations of Italian Disco. It couldn't live up to it's sister restaurants! We typically love Italian disco but we're pretty disappointed this time around. My meal was very dry, no sauce which was disappointing. I asked for more and thankfully it dramatically improved my meal. My husband had a salad and thought it had too much salt and his chicken was cold so he wasn't a fan. The third guests meal was loaded with garlic. We were bummed bc we were looking forward to eating there all weekend! Better luck next time! Pasta was outstanding Veal & Chicken francese were very good. The pork sandwich is not something we would do again. Next time we will try the pizza as well. Food just OK, service poor and ambiance lacking...place was lacking all around. I came here for dinner with four of my friends last night. We had to wait a few minutes for our table so decided to get drinks at the bar. I had the vodka cocktail which I’d highly recommend. 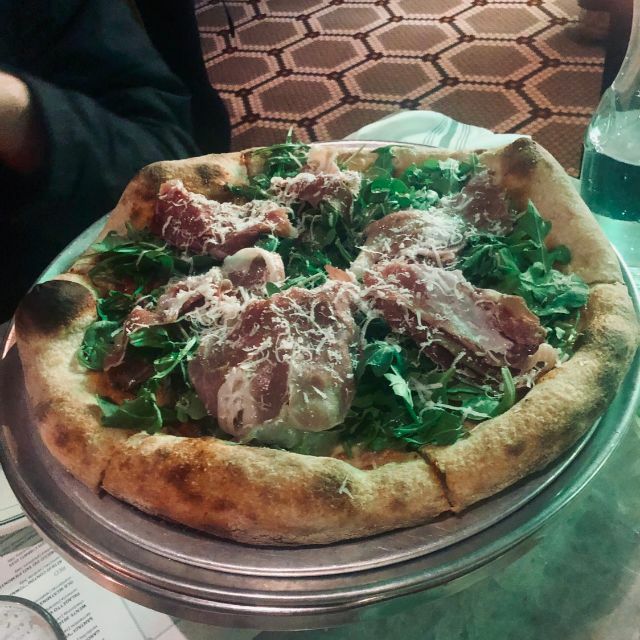 For dinner, I shared the prosciutto and arugula pizza. Perfect for 2 people and great taste. The Caesar salad would have been better with slightly less dressing. The beers are slightly higher priced than other restaurants so be warned. The vibe is what makes this place so cool. Disco lights and throwback music comes on around 9pm. That’s what this place has going for it. Is definitely go back for the pizza again. The food was generally good, but the pizza was odd. The sauce and toppings were good, but the very thin crust was tough. The noise level was extremely loud. At our two person table at the back of the restaurant, we could hear each other, and the server had difficulty hearing our order. Caveat, I dined at Italian Disco at 8:15 PM on a Sunday evening. I was surprised by the lack of attendance at the restaurant; most patrons were seated outside, we were rather alone sitting inside. Nonetheless, I thought the food was of high quality, and the beer selection was great, as well. However, I think that the prices for the products being delivered are out of line with the Baltimore market. For instance, Verde, in Canton, delivers a very similar product in terms of pizza, for a a similar price, but the pizza itself is noticeably larger at Verde (the crust and fresh toppings at Italian Disco were great). What gave me some pause is the audacity to charge $10 for a RAR Country Ride APA... this is not some rare Belgian Tripel, it is a local APA. I think the restaurant would be more highly trafficked if it were priced commensurately with the market... again this is Baltimore, not Manhattan. Took our kiddos on the 4th of July. Food was just awesome and the vibe is just fun! Great service from Robbie. A casual place that is a must stop in a Bmore that has perfectly crusted pizza!